BUILT TO TAKE YOU EVERYWHERE. FIRST CLASS. The road-loving Tiger 1200 XRX Low Ride Height (LRH) model is a more accessible version of this easy-handling bike, and is perfect for touring the world’s highways. The XRX LRH model comes with all of the XRX’s leading features plus an accessible 32 inch seat height, which is one inch lower than the standard Tiger XRX, and has an additional adjustable seat set-up which offers another .75 inch reduction to take the lowest seat height setting to 31.25 inches. 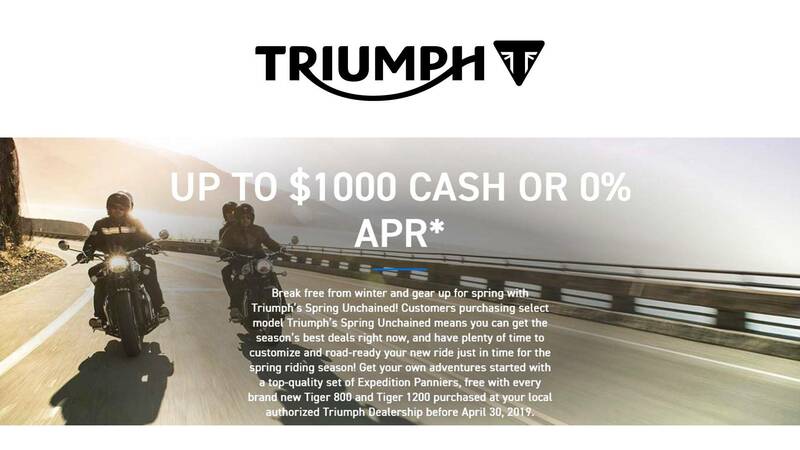 The more responsive Triumph Triple engine, enhanced ergonomics, lighter exhaust system and state-of-the-art technology from new full-color TFT instruments and switchgear and four riding modes, are just a few of the many features designed into this latest generation XRX. MORE POWERFUL AND RESPONSIVE ENGINE: The new generation, Tiger 1200 XRx LRH engine delivers more peak power (139 HP at 9,350rpm) and maximum torque of 90 FT-lbs (at 7,600rpm), for more immediate power delivery, and even better all-day, smooth reliable riding. NEW LIGHTER EXHAUST: The new shorter and lighter exhaust delivers a notably more thrilling Tiger Triple soundtrack. TECHNOLOGY: In addition to the XR spec, a host of high value XRx features include Daytime Running Light and LED lighting, full-color TFT Instruments, backlit new switch cubes and 5-way joystick, four riding modes and keyless ignition. RIDING MODES: With four riding modes on the XRx, compared with three on the XR, the new Tiger XRx can be set up to suit every condition with ‘Sport’, ‘Rain', 'Road', and ‘Off-Road’ throttle maps. NEW WHEELS AND HIGH QUALITY TIRES: Significantly enhanced specifications for better all-round capability, the XRx has new stylish black aluminum cast wheels fitted with Metzeler Tourance tubeless tires (front R19 x 3", rear R17 x 4.5"). ERGONOMIC IMPROVEMENTS: Practical enhancements offer an altogether better ride for a wider range of riders and riding styles; including a more comfortable seat compound, and new handlebar position to improve control both off-road and on. EVEN MORE TIGER STYLE: More contemporary premium bodywork and the highest ever level of finish and detailing with premium graphics and finishes to enhance that muscular Tiger 1200 style. ADJUSTABLE SEAT HEIGHT: The Tiger 1200 XRx LOW features an adjustable ‘2 position’ seat mechanism allowing the rider a lower seat height (31.8 inches or 31.1 inches) for a comfortable and stylish ride experience. HIGH SPECIFICATION SUSPENSION: The XRx premium adjustable WP suspension is delivered by the Triumph Semi Active Suspension (TSAS) system which allows the rider to set a level of electronic control over how the bike reacts to the ride. HIGH SPECIFICATION BRAKES: Twin 305mm floating discs and radially mounted 4-piston monobloc Brembo calipers with new BRM10B brake pads on the front, and a single 282mm disc with Nissin 2-piston sliding caliper on the back. 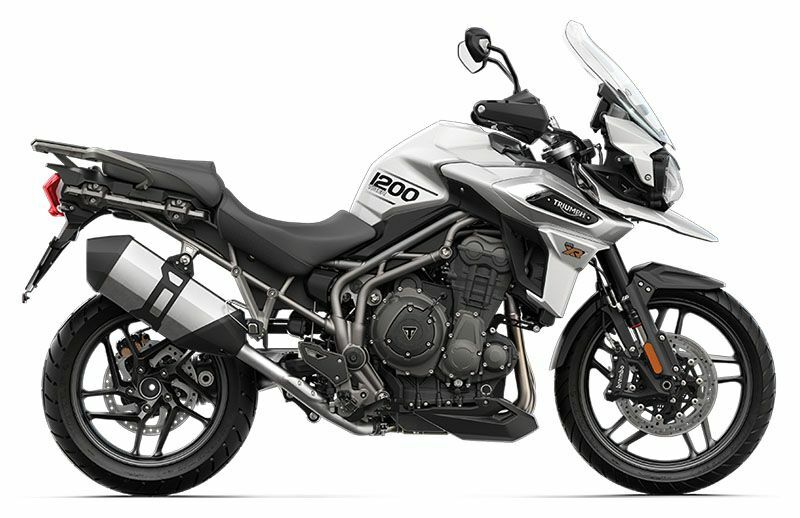 PREMIUM SPECIFICATION EQUIPMENT: There is an incredible level of standard equipment including integrated braking system, inertial measurement unit, torque assist clutch and electronically adjustable screen, all enabling the Tiger 1200’s supreme capability. Front - Cast aluminum alloy 10-spoke 19 x 3 in. Rear - Cast aluminum alloy 10-spoke 17 x 4.5 in.